Item #E168554 - Clear Crystal Silvertone Filigree Vintage Estate Post Earrings. 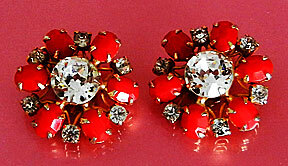 Item #E168548 - Signed Weiss Ruby Red Glass Stone Clear Paste Goldtone Vintage Estate Button Designer Clip Earrings. Designer: Signed WEISS. Albert Weiss is one of the world renowned designers of the 40's and 50's known for the top quality of his costume jewelry, on the par with Eisenberg, Boucher and other great designers of that era. 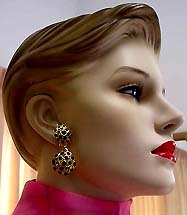 Signed Weiss gorgeous designer vintage button earrings! Hand pronged lustrous ruby red faceted glass oval stones alternating the small round clear rhinestones. The center is a brilliant 1/2" large paste stone to rival a big diamond. To those who are not familiar with paste stones, they are brilliant cut glass stones to look like a real gem stones. Clip backs. Excellent condition. Fabulous earrings for weddings, proms, parties and special functions! US$138.00. 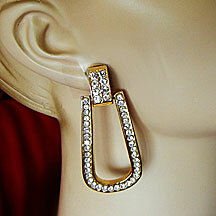 Item #E168555 - Art Deco Clear Crystal Goldtone Vintage Estate Dangle Clip Earrings. 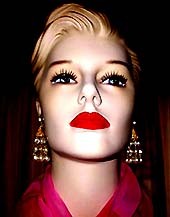 Bold vintage dangle earrings feature an Art Deco style door knock design! Glitzy clear crystals channel set in high-polish goldtone rim! Gorgeous and fashionable! Excellent condition. Clip backs. Fabulous earrings for weddings, proms, parties and special functions! US$138.00. 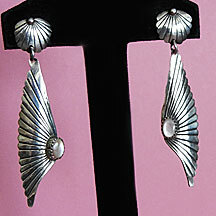 Item #E168542 - Sterling Silver Art Deco Retro Moonstone Vintage Estate Dangle Drop Post Earrings. 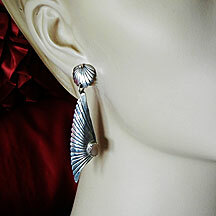 I love the classic Art Deco design of these gorgeous vintage sterling silver dangle drop earrings! The ear piece is a shell motif and the bottom piece is an etched wing spread accentuated by a lustrous oval moonstone mounted in a raised setting! They sway beautifully. You'll look very becoming wearing them! Excellent condition. Post backs for pierced ears. Fabulous earrings for weddings, proms, parties and special functions! US$168.00. 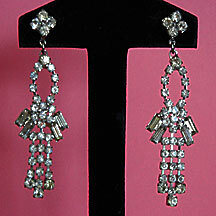 Item #E168535 - Clear Rhinestone Silvertone Vintage Estate Chandelier Dangle Post Earrings. These pretty clear rhinestone vintage earrings feature round and baguette stones and are done in an oval loop and drippy tassel design. The swing invitingly at the slightest quiver. Even though the baguette stones are not perfect, they don't take away the beauty of these gorgeous earrings. All the stones are pronged in a shiny silvertone finish. Excellent condition. Post backs for pierced ears. 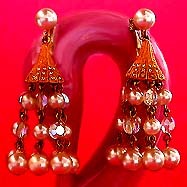 Fabulous earrings for weddings, proms, parties and special functions! US$118.00. Item #E168426 - Signed Marvella Ice Topaz Sky Blue Large Domed Crystal Vintage Estate Designer Clip Earrings. Size: Length: 1 1/8" x Width: 1 1/8". Height: 5/8". Designer: Signed MARVELLA on clips. Signed Marvella Ice crystal designer vintage earrings! Multi-faceted big, bold, domed, round, shimmering ice topaz crystal held by four large crown prongs mounted in a goldtone open back setting to reflect even more fiery glitters! The dome center has a sparkling sky blue oval cut crystal lending for stunningly beautiful color contrast. The round topaz crystal measures generously at 1 1/8" and domed to 5/8" tall! So gorgeous and noticeable. Clip backs. Excellent Condition. Fabulous earrings for weddings, proms, parties and special functions! US$138.00. 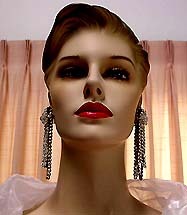 Item #E168443 - Unique Two Layer Clear Rhinestone Silvertone Vintage Estate Antique Dangle Drop Clip Earrings. 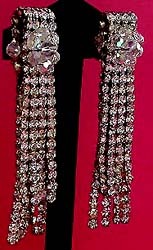 These gorgeous clear rhinestone vintage dangle earrings are so unique! Note the two layers of the glistening rhinestone strands! The first layer is rigid at the top contrasting the remaining length that dangles freely. Now, are you sitting down? The rhinestone strands of the second layer are hung from the back of the clips so that the strands can drape apart from the first layer. This smart and unique design gives a distinct separation of the two layers. 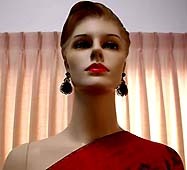 Furthermore, the second layer drape lower than the first so that the strands at the back extend longer than the front achieving a more dimensional and drippy effect. One-of-a-kind! Clip backs. Fabulous earrings for weddings, proms, parties and special functions! US$128.00. Item #E168373 - Signed Miriam Haskell Blue Turquoise Glass Bead Gilt Brass Vintage Antique Estate Clip Earrings. Size: Width: 1 7/8". Length: 1. One of Miriam Haskell's older pieces done in an exquisite fan motif with lustrous blue turquoise glass beads handwired to gilt brass edged leaves. The leaves are articulated and slightly tilted for depth and richness. Center has decoratively edged gilt brass petals embrassing a large blue turquoise round glass lustrous bead, all handwired to an ornately edged gilt brass filigree double layered base. Clip backs. Excellent condition. Fabulous earrings for weddings, proms, parties and special functions! US$238.00. Item #E168308 - Jet Glass Filigree Antique Goldtone Vintage Drop Screw Back Earrings. Flaw: A small chip on the oval stone. Not noticeable at all. Size: Length: 2". Width: 1 1/4" at the widest point. Gorgeous jet glass oval stone mounted into an extremely ornate antique goldtone filigree finding! Note the meticulous openwork detailing front and back, and the wonderful construction of these very estate and Nouveau looking vintage estate antique earrings. The large ovals (1"x 3/4") have diamond faceting and are gleaming with luster. The entire drop is 1 1/2" in length. Very flattering indeed! Screw backs. Excellent condition. Fabulous earrings for weddings, proms, parties and special functions! US$128.00. 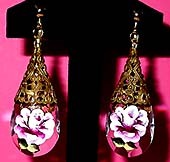 Item #E168321 - Clear Genuine Crystal Antique Brass Hand Painted Rose Vintage Style Dangle Drop Earrings. (Available in gold plated clip backs or gold plated ear wires). Romancing the stone! Beautiful briolette cut clear genuine crystal drop embraced in a gorgeously textured open work ornate brass cone reminiscent of romantic Victorian lace and gilt brass. The exquisitely hand painted pink rose further eccentuates Victorian romanticism. The lovely reflective briolette cut clear crystal drop measures 1 1/2" x 1". The crystals exude ice clarity and fire polished faceted glitter! Though not marked, the clips are gold plated. These 2 �� beautiful earrings are comfortable to wear (each weighs only 0.5 oz). They sway alluringly at the slightest toss. Feminine, gorgeous, graceful and romantic! 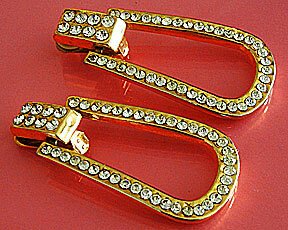 Clip backs but can be converted to gold plated ear wires for pierced ears. Just let me know which you prefer. Mint condition. Fabulous earrings for weddings, proms, parties and special functions! US$98.00. Item #E168289 - Unique Haskellesque Style Teal Blue Clear Rhinestone Mesh Goldtone Vintage Dangle Drop Clip Earrings. Wow, aren't these Haskellesque style specutacular, unique dangles just absolutely divine?! First, the ear piece is a beautiful showy floral dome measuring 1" wide and 5/8" tall. It is embellished by antique goldtone roses and various shades of blue faux pearls and beads in different sizes and texture. The roses have layers of shimmering texturised goldtone petals, one rose holds a glistening sapphire blue faceted crystal rhinestone and the other a smooth lustrous teal faux pearl. The beautiful dome also has prong set glitzy clear round rhinestones accenting the pearls and beads. Further, there is a shimmering mesh goldtone thick tube rope intertwining all along the dome rim to underscore the spectaculars! This fabulous gem galore is hand mounted by wire onto a scalloped filigree goldtone base. Now, that's not all it, I did say unique, didn't I? Are you sitting down? Note that the two long beaded strands are dangling from the side and not the middle. The strands are sitting higher on the side to make the dangles even more noticeable. This unique design truly sets these outstanding earrings apart from the norms. I live and breathe jewelry and have rarely come across a pair dangling so beautifully like this! 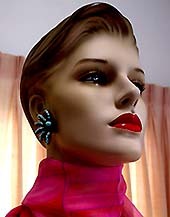 Please see how they look on Crystal, the mannequin, on the large photos. 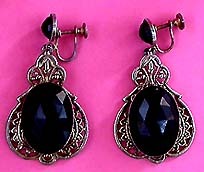 These awesome vintage estate antique earrings are to die for, a true rare find! Clip backs. Excellent condition. Fabulous earrings for weddings, proms, parties and special functions! US$168.00. 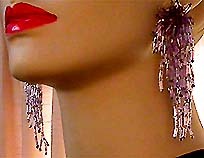 Item #E168254 - Lilac Purple Glass Bugle Bead Vintage Dangle Chandelier Clip Earrings. Dramatic, gorgeous, bold and wild! These fabulous earrings are done in beautiful glistening lilac purple glass bugle beads and glitzy lilac glass seed bead spacers. The glorious strands, varied in lengths, overlapping one another to create volume and throw off extra glitters. They drip with fluidity like a gorgeous shimmering waterfall. Magnificent! Clip backs. Excellent condition. Fabulous earrings for weddings, proms, parties and special functions! US$148.00. 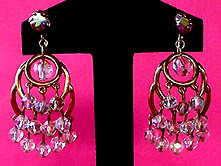 Item #E168402 - Aurora Borealis Clear Crystal Goldtone Rhinestone Vintage Estate Antique Chandelier Dangle Clip Earrings. Item #E168395 - Emerald Green Crystal Rhinestone Goldtone Vintage Estate Antique Dangle Drop Earrings. Size: Length: 1 3/4". Width: 1" at the widest point. These beautiful vintage dangle earrings are so sweet! Don't they look like honeycombs? The rich emerald green crystals are twinkling with sparkles at the every sway. Both the ear piece and pendant are domed and have a lot of milligrain work surrounding the stones creating gorgeous texture and dimension. Emerald green stones and gold texture go so richly together. Clip backs. Excellent condition! Fabulous earrings for weddings, proms, parties and special functions! US$68.00. SOLD. Item #E168377 - Signed Hattie Carnegie Art Deco Clear Rhinestone Crystal Silvertone Vintage Antique Estate Dangle Long Drop Clip Earrings. Item #E168372 - White Faux Pearl Aurora Borealis Crystal Blush Goldtone Vintage Dangle Drop Chandelier Clip Earrings. Suspending from a lustrous white round faux pearl is what looked to be a China man's hat where six glorious strands of luxuriant smooth pearls and glittering Aurora Borealis crystal beads are hung! The 'hat' accented by glitzy clear rhinestones has a gorgeous Russian blush goldtone texture lending for an exotic flair. Its circular shape allows the gem strands to flair open like a ballerina jeweled skirt! Excellent Condition. Fabulous earrings for weddings, proms, parties and special functions! US$88.00.